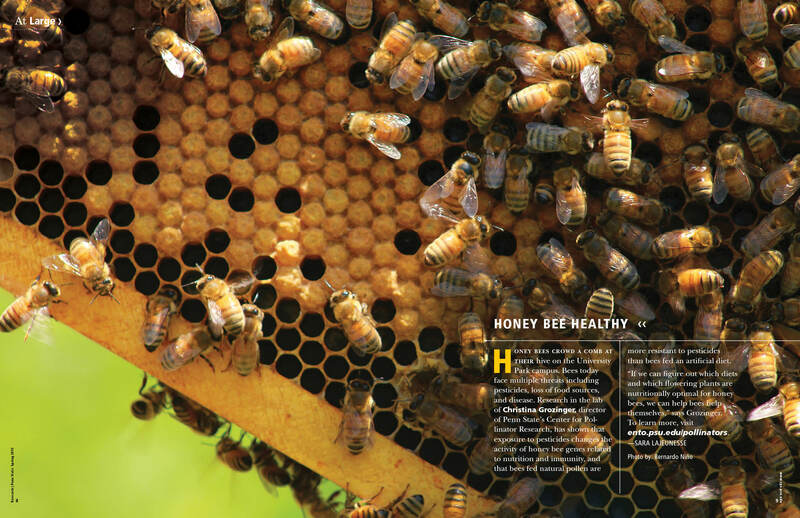 The winner of our first At Large photo contest is Bernardo Niño, whose close-up shot of honey bees at their hive is so vivid that it makes us hear the buzzing and taste the honey. Bernardo’s photo appears in the spring issue of Research|Penn State, which will arrive on campus in mid-April. In addition to publication of his photo in Research|Penn State, Bernardo will receive a high-quality print of the At Large spread, suitable for framing. Bernardo was a research technician in the lab of Christina Grozinger at the Center for Pollinator Research from 2009 to 2014. You may have read about the challenges facing bees today, including deadly mite infestations and viral infections and loss of natural food sources due to habitat loss. Grozinger’s lab is investigating these threats and how we can bolster bees’ natural defense systems to keep them happy, healthy, and on the job as pollinators of some of our most valuable crops. Thank you to all who sent images for our consideration. There are many good photographers here at Penn State! And now, we launch the search for another superb research-related photo to run as our At Large feature in Research|Penn State magazine. As you can see from Bernardo’s image, the photo must fill a full two-page spread and be visually compelling. Magazine staff will write the short description of how the image relates to Penn State research. • Images must be strong horizontals so one shot can completely fill a two-page spread. • Images must be available at high resolution, at least 300 dpi (this is not the same as ppi). Keep this in mind as you shoot photos, especially through microscopes. We have had to eliminate beautiful images from consideration because they were not shot at a high enough resolution to be enlarged to publication size. • Images must relate to research being conducted by someone at Penn State. • Images can be scenics, close-ups, or micrographs. They can be realistic or abstract (such as a patterned structure), color or black & white or colorized. Archival shots will also be considered. • We do not use portraits. When we use a shot with a person in it, the person is small within the frame. Please send your photos to me, Cherie Winner, at clw43@psu.edu. Lo-res versions are fine at this stage. If we select your image, we’ll ask for the hi-res version. Deadline for submission is Friday, July 31, 2015. For more information, use the contact form below or call me at 3-4750.